Patients with fibromyalgia exhibit increased severity in migraine headaches and an increased rate of depression related disability, according to a study published by The Journal of Headache and Pain. Migraine is a debilitating condition that is commonly found among fibromyalgia patients, with between 18 and 35 percent of fibromyalgia patients being affected by migraine headaches. The quality of life experienced by fibromyalgia patients can be greatly reduced when both conditions are present. 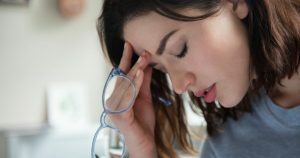 Previous studies have established a link between migraine headaches and fibromyalgia pain, with more migraine sufferers receiving a diagnosis of fibromyalgia than do patients with tension headaches. To corroborate these findings, researchers at the Mayo Clinic Rochester conducted a study to determine if migraine headaches present in fibromyalgia patients demonstrated increased severity, depression symptoms, and headache-related disability rates than in migraine sufferers without a diagnosis of fibromyalgia. To conduct the research, a total of 157 patients with both migraine headaches along with a diagnosis fibromyalgia and a control group of 471 patients with migraine only were enrolled in a study between 2012 and 2017. Study participants were evaluated on several factors including BMI, the average duration of migraine headaches, number of headache days each month and the initial age of onset for migraine headaches. No significant differences were present regarding these factors between the two groups. Patients were also analyzed using the MIDAS scale to determine migraine-related disability and for rates of depression using the PHQ-9 patient health questionnaire. Study participants in the migraine and fibromyalgia group demonstrated higher PHQ-9 scores, indicating a higher rate of depression along with an increased severity of depression symptoms over participants in the non-fibromyalgia group. Participants in the migraine with comorbid fibromyalgia group also exhibited a higher frequency of migraine headaches and an increased severity of migraine headaches over the migraine only control group. Data collected using the MIDAS (migraine disability assessment scale) questionnaire, provided information regarding disability days related to migraine and inability to complete daily tasks. No significant differences were noted between the two groups. However, further analysis of the data suggested that participants in the fibromyalgia with migraine group scored a higher rate of migraine-related disability overall. The findings of this study have assisted researchers in further understanding the complex relationship between migraine headaches and fibromyalgia. Researchers have determined that the presence of fibromyalgia in migraine sufferers has been correlated with a lower quality of life, and suggest diagnostic screening tools for signs and symptoms associated with fibromyalgia in migraine sufferers. These findings underline the importance of interviewing migraine patients about their pain symptoms to detect the presence of fibromyalgia, as well as emphasize the necessity of fibromyalgia screening tools in creating an effective and ideal treatment plan that takes both conditions into account. If you’re suffering from fibromyalgia, migraines, or both our alternative treatments can help. Some of the most effective treatments for chronic pain, migraines, and fibromyalgia include acupuncture, massage, and chiropractic treatments. According to the American Migraine Foundation there is evidence that acupuncture reduces the frequency of migraines or headaches in general. The effect acupuncture had on migraines is similar to the effect observed with preventive medication. With acupuncture frequency of headaches are dropped by 50% or more in up to 59% of individuals receiving acupuncture for migraines. This effect can persist for more than 6 months. By focusing on the neck, shoulders, and head massages can decrease the pain brought on by migraines or tension headaches. If massages for headaches are performed on a regular basis it can reduce the frequency and severity of headaches. In the few studies that have been conducted to evaluate using chiropractic treatments to treat migraines, chiropractic patients saw a significant improvement in migraine frequency, intensity and duration compared to the control group that did not receive treatment. Fibromyalgia massage therapy focuses on techniques that encourage circulation in the muscles and increases the flow of nutrients while eliminating waste. For Fibromyalgia suffers, massage can reduce their heart rate, relax muscles, improve range of motion in joints, and increase the production of natural substances that act as painkillers. Chiropractic treatments can treat pain at pressure points, in their back, neck, shoulders, and other joints, and from headaches and injuries. Although there haven’t been many studies, some Fibromyalgia patients swear by chiropractic treatment. Chiropractic sessions can help you hurt less and help you move your neck and lower back.